In previous blog posts and demos we showed that a simplified approach is the way to obtain clear results in deploying VoLTE and 2G/4G mixed networks. 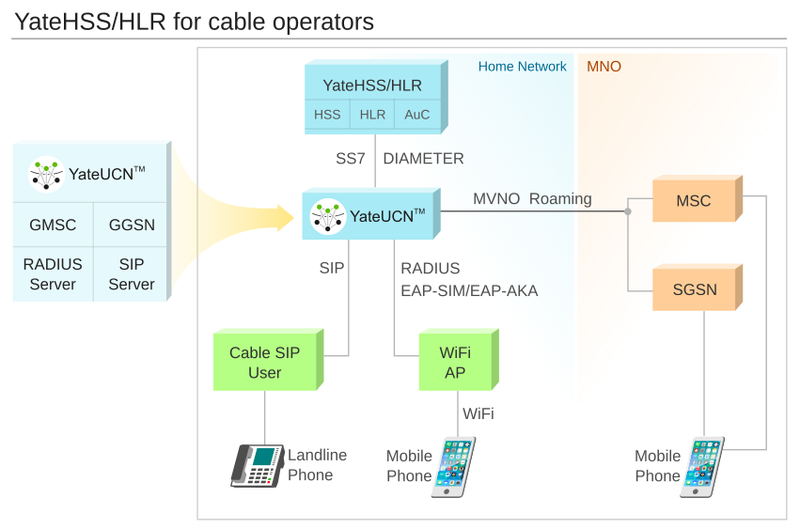 We performed the industry’s first VoLTE call from a GSM mobile phone to an iPhone 6, through a single unified core network, the YateUCN, and we presented our solution for handling SRVCC (Single Radio Voice Call Continuity) as an inter-MSC (Mobile Switching Center) handover from 4G to 2G in the same YateUCN. 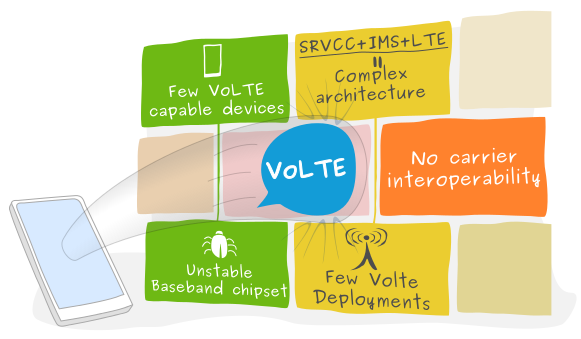 Follow our take on why VoLTE hasn’t developed as rapidly as we all expected it would. We’ll give our insight and what we’ve learned from the many discussion we’ve had with mobile operators and smartphone producers alike. Sure, VoLTE is great! Combining the powers of IMS and LTE, VoLTE offers excellent high-definition voice calls. It also guarantees a Quality of Service component, ensuring that customers get an unprecedented quality of voice services. However, VoLTE depends on far too many aspects to be fully functional and widely deployed, contrary to what optimistic reports have predicted in the past. One of the main issues operators and customers alike are facing is the fact that there’s still a shortage of VoLTE capable smartphones. By April 2015 Verizon offered around 15 devices supporting VoLTE, while AT&T’s smartphone selection included around 19 devices capable of HD voice, in July 2015, as seen on their online shop. iPhone6 is still the only device capable of supporting VoLTE for all the operators that offer it. What’s more, most of these devices came from about 5 smartphone vendors, giving customers a limited choice when they buy a new phone. Approximately 97% of VoLTE capable smartphones have their LTE chipset from the same vendor. According to reports from smartphone producers and operators alike, the VoLTE client is not stable enough, this being the reason why some vendors don’t even activate VoLTE in the baseband, and also why operators implement VoLTE in both the smartphones and the IMS network itself differently. This also leads to the lack of interoperability between mobile carriers. Currently, VoLTE works only between devices belonging to the same network: for example, a T-Mobile customer using a VoLTE capable handset cannot roam in the AT&T VoLTE network of a called party. However, this was one of the main goals when VoLTE specifications were developed and we should still expect it to happen at some point. Lastly, and perhaps most importantly, VoLTE deployments are scarce. A GSA report from July 2015 showed that only 25 operators have commercially launched VoLTE networks in 16 countries, while there are around 103 operators in 49 countries who are planning, trialling or deploying VoLTE. Compared with the total of 422 LTE networks commercially launched in 143 countries, VoLTE deployments are dramatically lower. This is the result of mobile carriers having a difficult time planing and building functional LTE and VoLTE networks, while also developing the essential Single Radio Voice Call Continuity (SRVCC) technology in an effective and performable way. VoLTE still needs to leap over many hurdles until it becomes a technology used world wide. Operators, network equipment vendors, smartphones and chipset producers need to cooperate and jointly find technical solutions that will allow for a more swift VoLTE roll-out in most LTE networks. 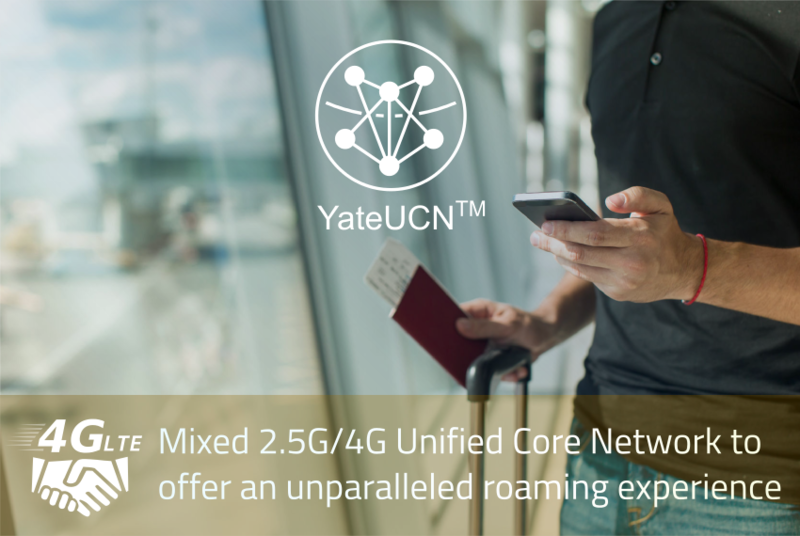 We’ve often stated that YateUCN, our unified 2G/4G core network solution, can be used to extend existing LTE networks or upgrade GSM deployments to 4G LTE. And that’s correct. In this post we will take a closer look at how that happens and why YateUCN is more profitable than current solutions for operators moving towards LTE networks. YateUCN is designed as a unified equipment that replaces all the functions performed by separate hardware components with one software application running on commodity hardware. This has the advantages of reducing the infrastructure costs, minimizing the equipment’s time to market, and increasing network resiliency due to a simplified management of software. Let’s look at two scenarios where YateUCN can be integrated in existing networks. For operators looking to increase access to 4G services YateUCN is a flexible, cost-effective solution. It drastically reduces initial equipment investment, allowing them to roll out more networks in a shorter time, to better serve growing consumer needs. This can be done easily because YateUCN integrates all the LTE-specific functions and protocols, so that it interconnects with any existing operator setup. Every hardware component in the EPC – the MME, SGW, PGW, PCRF, and PCEF – is replaced with software running on a single piece of equipment. The MME function handles UEs trying to connect to the network. It is responsible for subscriber authentication and uses S6a interface (Diameter) to connect to the operator’s HSS. The MME is also in charge of mobility management, allowing UEs continuous connectivity and active sessions as they move through the network. YateUCN is fully compatible with any eNodeB, using S1-AP interface to manage inter-MME handover. The SGW function allows YateUCN to manage data traffic routing over S1-U interface, ensuring communication between the eNodeB and the PGW, which establishes and maintains the IP session. The PGW interconnects with the charging solution of the operator using Diameter and Radius interface, allowing AAA management for wireless access. The PCRF in YateUCN maintains QoS levels and charging policies, enabling mobile operators to control bandwidth usage while their subscribers are roaming. The Policy and Control Enforcement Function, PCEF, performs policy enforcement and service data flow detection, making sure the data flow through from the PGW is accessible. 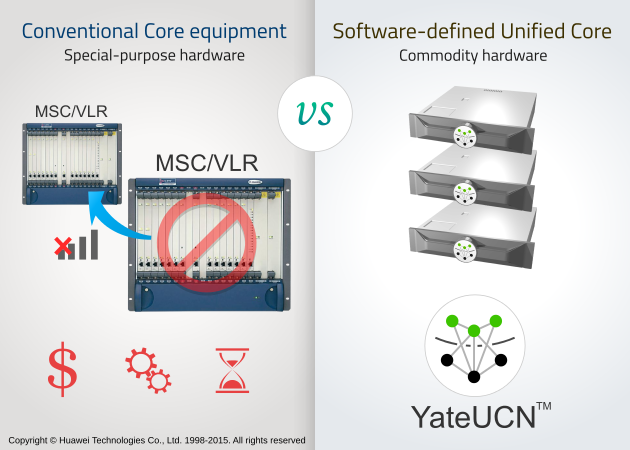 The unified nature of YateUCN leads to large equipment savings, and makes it easy to manage the network capacities with a software upgrade. 2G/3G networks can be upgraded to 4G LTE using YateUCN core network and SatSite for the radio network. 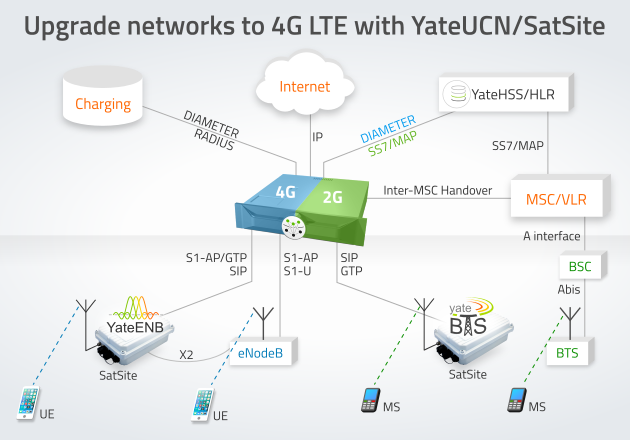 A new LTE network with YateUCN and YateENB SatSite significantly reduces overall network roll-out costs. SatSite operating on YateENB is an eNodeB communicating with the MME in YateUCN over S1 interface and with any other eNodeB over X2 interface. Since YateUCN also unifies all the layers of the GSM/GPRS core alongside the EPC, it also acts as an extension of existing 2G networks, achieved at no costs for additional 2G core equipment. SatSite can run on YateBTS and YateENB at the same time, so each cell will act as a mixed 2G/4G site. As a result, operators can choose to use SatSite in mixed 2G/4G networks, without needing a new 2G core. What’s more, since in 2G mode YateBTS SatSite unifies both the BTS and the BSC layer, it communicates directly with YateUCN core network, using the SIP/GTP protocols. 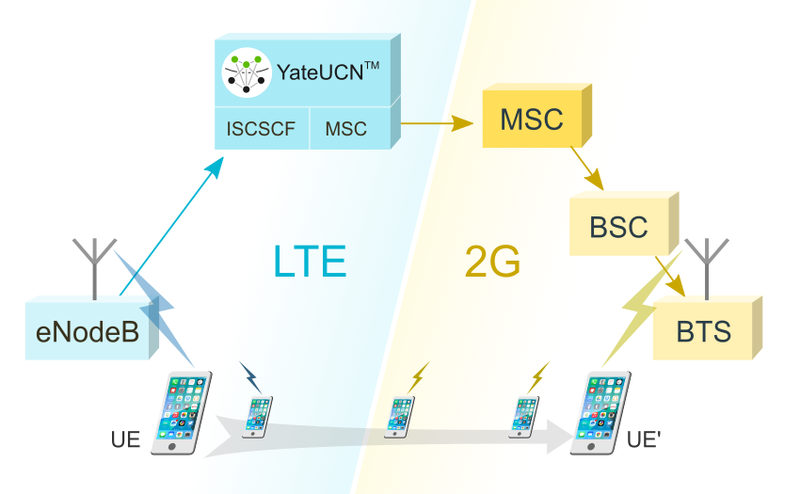 The MSC contained in YateUCN allows subscribers to be handed over from the YateUCN – SatSite network to the operator’s current 2G deployment in the case of CS services mobility. Subscribers can roam from the YateUCN/SatSite network to any existing MSC serving the roaming area to ensure voice services continuity. YateUCN can be integrated in any system already deployed by the operator. Used together with SatSite, it serves to build complete 4G LTE or mixed 2G/LTE networks with a low infrastructure and operations investment, ensuring consumers consistent access to both voice and data services. Mobile communications must provide uninterrupted mobile service at all times, but the costs to create network redundancy with current conventional equipment are restrictive. 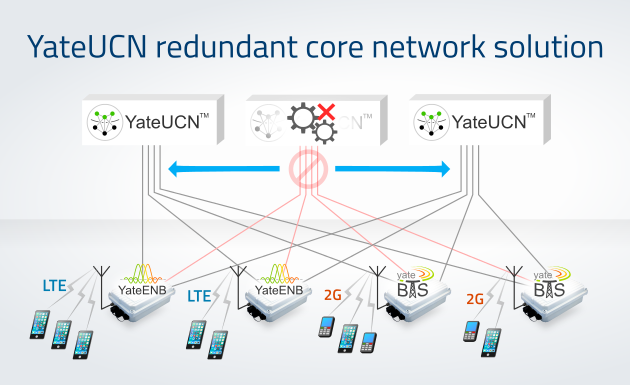 YateUCN unified core is a profitable and flexible solution for redundancy in 2G and 4G mobile networks. Network redundancy ensures that as technology advances, the capacity of network infrastructures to support more subscribers without blackouts adapts accordingly. 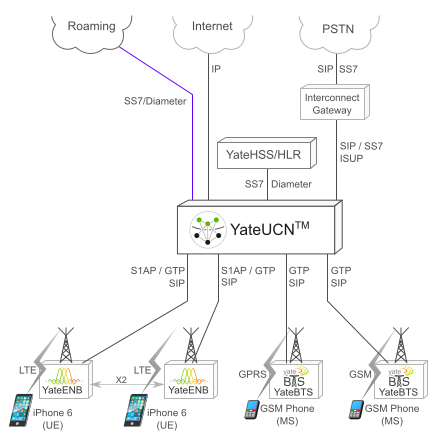 YateUCN is a unified core network allowing resiliency in 2G/LTE mobile networks using YateBTS and YateENB SatSite. SatSite acts as a BTS/BSC communicating directly with the MSC/VLR/SGSN/GGSN and EPC in YateUCN. As a software-defined core solution, YateUCN replaces the heavy, expensive core equipment used in conventional networks with smaller, affordable, and easy-to-manage equipment. It is a software implementation of 2G and LTE core network layers, operating on commodity hardware. In typical networks, redundancy is achieved by supplying an additional core server for any given core server, causing costs to more than double, since supplementary costs for the configuration of back-up servers add up to the capital expenses. YateUCN implements the core network functions and protocols in software, enabling any other YateUCN node to take over extra-traffic in case of failure of a node, or if the network capacity needs to be increased. While conventional MSC/VLR in data centers are limited to serving a given number of BSCs in a defined geographical area, in a YateUCN – SatSite network the base station allows a device to connect to any YateUCN node in the network, irrespectively of the geographical location of the device/BTS and of whether the network is 2G or 4G. A list of available YateUCN units is configured in each YateBTS/YateENB SatSite. Core equipment is usually designed to allocate specific core network functions (authentication, mobility, call setup, data routing) to separate nodes. Such equipment is heavy due to the large number of components, increases lead time, and requires separate back-up equipment for each node. 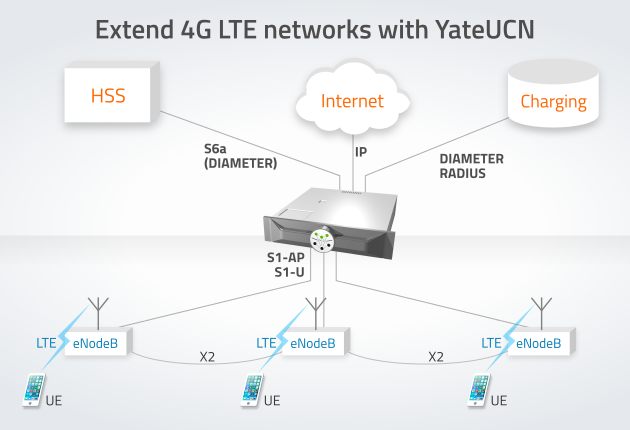 YateUCN unifies both GSM and LTE core layers, meaning that a single alternate YateUCN server provides full redundancy for any other server in the network. If a failover should occur in a YateUCN node, a device can register to a different YateUCN, remaining attached to the same base station, as shown below. A new YateUCN is chosen from the list of YateUCN units held in the base station. 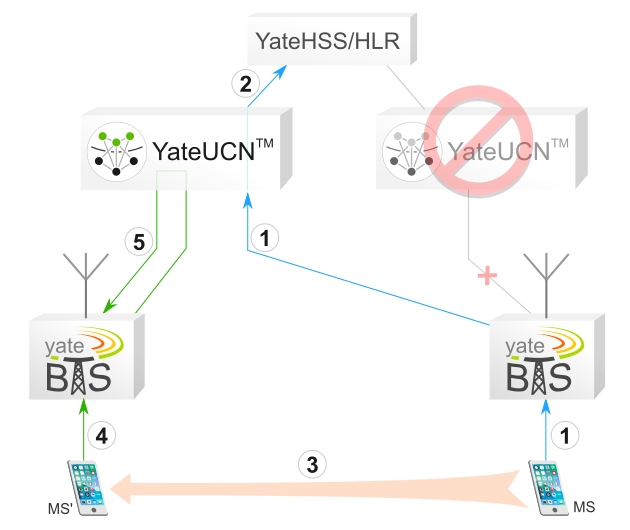 If a mobile device remains connected to the same BTS, registration to the MSC/VLR in the new YateUCN is performed whenever the device communicates with the network to perform an action. Registration to the new YateUCN is updated in the HSS/HLR. Increasing traffic to a YateUCN core server is easily performed because YateUCN communicates with 2G base stations using SIP and GTP, and with eNodeBs over SIP/S1AP/GTP. SIP and GTP signalling protocols have the advantage of scalability and interoperability, allowing different service requirements to be served at the same time and with the same quality standards. Because YateUCN uses commodity hardware, operation and servicing can be managed remotely, with minimal external support, significantly driving operational costs down. YateUCN provides simplicity and cost-effectiveness to building redundancy in mobile networks so that operators can provide high-quality service at all times. Cable companies have had an increasing interest in tapping new market opportunities, as consumption of voice and data sees unprecedented growth. 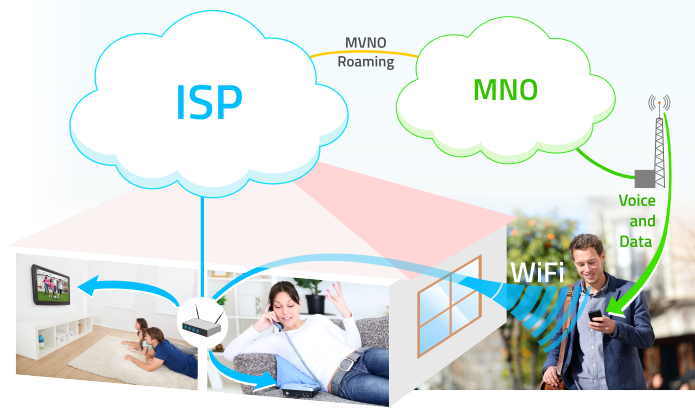 For most cable providers, going from triple play to multi-play is the logical move on customer demand, so the MVNO route naturally seems the next step. New needs and use patterns on subscribers’ end make the integration of home and mobile services anytime and anywhere necessary. But as cable operators opt to provide WiFi hotspots to their customers, they also need to offer mobility options if they want to turn them into dependable subscribers. That’s why it goes without saying that rolling out small, private WiFi networks is not enough for most cable operators. If they want to stay in the competition and provide a mix of media services, voice, and data, they need access to the mobile network capabilities by associating with an MNO. Partnering not only between a cable company and a mobile network operator, but also between cable providers, is becoming more and more common. On their side, cable companies rally up to ensure they secure themselves a share of the market. Major players on the US cable providers market, for example, part of the ​CableWiFi alliance, were estimating the deployment, early 2015, of as many as 10 million new WiFi hotspots around the country, in both homes and businesses. Dual-SSID access points in subscribers’ homes allow the provision of a separate signal for outsiders, who can use that home hotspot without slowing down the network or being granted access to the subscriber’ home network. All the members of the CableWiFi alliance allow their subscribers to use each others hotspots, so, between the five, this could act as a self-reliant WIFI network that uses cellular networks to fill in the ‘gaps’. Major benefits are evident; cable operators will acquire more customers for their new offerings, while subscribers will gain from getting all their services in one place with reduced subscription costs. But the success of this model still depends highly on cable companies getting to partner with MNOs, who have the necessary network resources to make this model work. As for mobile network operators, more connected subscribers equals more revenue, which for now may be more to work with than nothing. As promised in our last LTE technology post, we want to tackle a new technology used in voice in 4G: Single Radio Voice Call Continuity. We’ll explain what SRVCC entails and give you an insight into our own approach towards this technology: inter-MSC SRVCC from 4G to 2G. While most voice traffic in LTE is provided with CSFB, today the next stage involves using VoLTE and a technology called SRVCC for providing seamless voice continuity from LTE to other 2G/3G networks in areas not covered by LTE. One of the main issues for LTE for operators is that deployment is spotty and incomplete. Once the big challenge of deploying VoLTE has been achieved, operators have to use SRVCC to offer subscribers continuous voice traffic when they reach an area without LTE coverage. SRVCC allows for inter-Radio Access Technology handover, while also providing handover between a packet data-only network to a CS network. As the name suggests, SRVCC removes the need for two simultaneous active radios in devices, as required by CSFB, preserving the battery life, and manages to maintain continuous QoS during voice calls which are in progress. SRVCC is also a mandatory technology for maintaining continuity during emergency calls. Typically, SRVCC enables voice and data handover from LTE to legacy networks and viceversa. To enable SRVCC, operators need to upgrade their legacy MSCs, the LTE RAN and EPC and the IMS network for VoLTE. We have a different, simpler approach to offer operators: our YateUCN™ server handles SRVCC by performing and inter-MSC handover from 4G to 2G. Built to simultaneously be an MME/MSC and the IMS network for VoLTE, YateUCN performs SRVCC without the additional network upgrades (in LTE and 2G) mentioned above. With YateUCN, the SRVCC handover will be performed as simple as an inter-MSC handover, without the additional investments normally required. We are committed to innovation and believe in providing software-defined mobile network equipment, designed to cater to both 4G and 2G, while relieving operators from the huge costs of upgrade, maintenance and service. Our resilient and scalable YateUCN embodies this philosophy entirely. With LTE, operators are now able to offer their subscribers huge bandwidths and significantly improved quality of service, but they also have to face new challenges. LTE drastically changed the mobility architecture and led to the adoption of new interfaces, frequencies, protocols, which ultimately impacted on the state of roaming. A 2013 Informa report on the market status of LTE Roaming found that most operators hadn’t even finished their roaming strategy. By 2015, operators who deployed LTE networks had data roaming only in a few countries. Our answer to the LTE roaming dilemma is YateUCN. Each roaming protocol requires new roaming and interconnect agreements, even with existing partners. Therefore, once an operator deploys a 4G network, it will need new roaming agreements for their LTE subscribers. YateUCN, our core network solution, allows 4G devices to authenticate to foreign partners over SS7 roaming agreements, to an HLR. YateUCN is a mixed 2.5G/4G core network server, capable of replacing all the core network equipments associated to both networks, while also using both Camel/MAP and Diameter for roaming. YateUCN also makes it possible for 4G devices to be registered to a 2.5G network and a 4G network at the same time, if necessary. With the innovative YateUCN, MNOs will tap the great opportunity LTE roaming is, while also using the standing roaming agreements with their partners. Operators will gain time to set up the right agreements, and at the same time will garner new revenues by encouraging their customers to use data roaming.